Sunshine Village sits high on the Continental Divide in the heart of Banff National Park, yet just 15 minutes drive from the cozy mountain town of Banff. It is truly Canadas Best Snow. The resort features more than 3,300 acres of skiable terrain, ranging from gentle, inviting beginner runs all the way up to the most extreme big mountain runs. 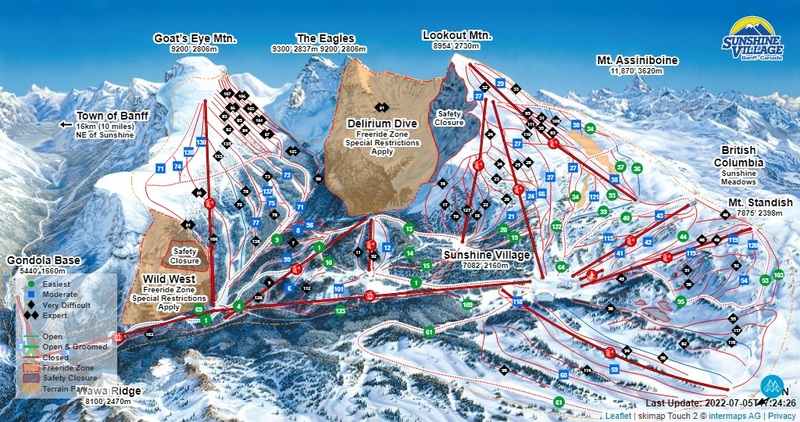 Delirium Dive has been named one of the 10 top off-piste destinations in the world. The resort also features the massive 12-acre Rogers Terrain Park with more than 50 features once fully operational.